The above chart shows the total number of oil and gas drilling rigs operating in the United States, by week since 1987 (source: Baker Hughes). 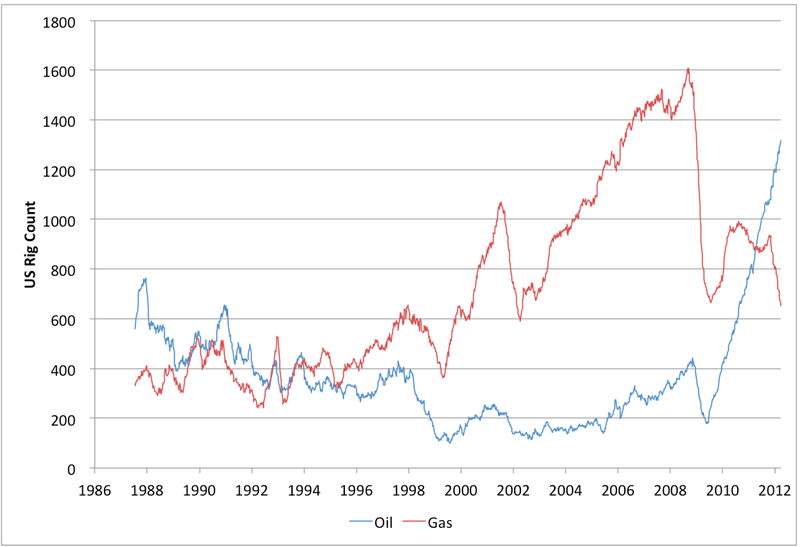 You can see the shale gas boom of the mid 2000s, which has fallen off since with lower natural gas prices. You can also see the truly massive run-up in the count of oil rigs since 2009. 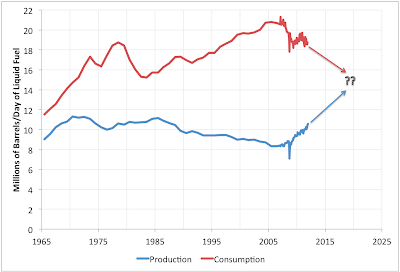 This drilling boom is what has driven the increase in recent US production, and caused the spread between WTI and Brent oil prices, as the infrastructure has failed to keep up with the increase in production. 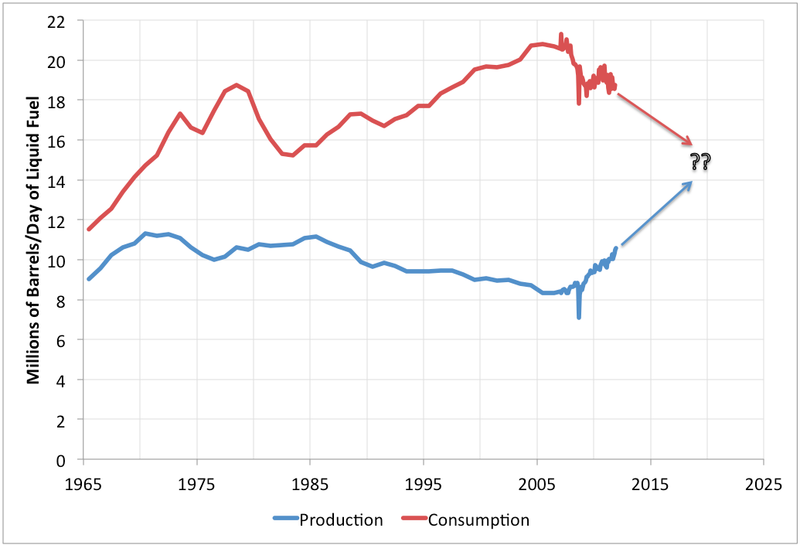 Here the rigs are the blue curve on the left scale, while the production change (percentage over prior year) is the red curve on the right scale. 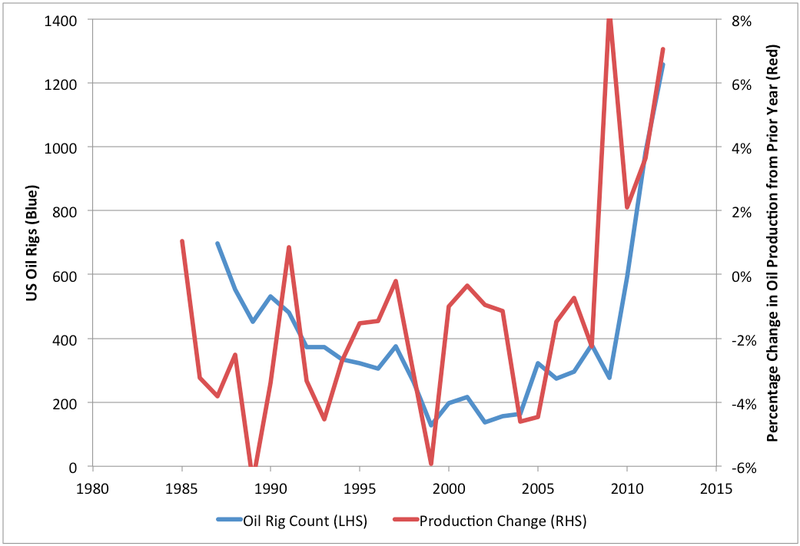 During most of the last few decades, production and rig count were both declining (as prices were not high enough to support aggressive exploitation of the remaining high cost reserves). The rig count began increasing in the mid 2000s and this led to some pretty noticeable production increases starting in about 2008. 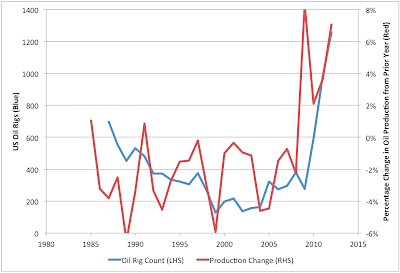 Now the rig count has gone vertical and one assumes that most of the production increases from that are still to come. However, the correlation between the rigs and production changes is quite weak so I don't think this leads to a clear quantitative prediction. Still, I have to wonder whether the WTI-Brent spread is going to be with us for a little while longer. I've also been keeping an eye on the gas rig count in the US and it is clearly falling off a cliff. It is well known (TOD posts, etc.) that frack'ed wells deplete extraordinarilly fast during the first 12-24 months on stream so one would expect US gas production to follow the rig count down with 6-18 months delay. Of course conventional wells still produce the bulk of US nat gas, but nevertheless I would expect a pretty clear response in gas produciton soon. 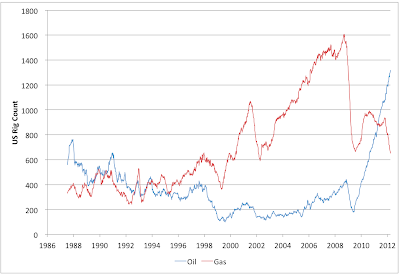 Why did the steep drop in 2008/09 in nat gas rigs not result in a production drop in 2010/11? In fact the production increased substantially during that time. Why do you think this is? One big factor is "associated gas" - there are a lot of oil wells that produce a fair amount of gas, and the gas can be sold at very low prices and overall the well will be very profitable. In fact, there are many wells that mostly produce gas, but the oil and NGLs still carry the whole operation. Another factor: many gas wells were drilled in 08, before the Panic, and not completed until later. Drilling rebounded quite rapidly, because many companies had long-term hedges in position, and many had to drill to hold newly leased acreage, and, I suspect because the industry didn't suspect that the Haynesville would, in just 4 years, exceed the Barnett in daily volumes. The Haynesville really queered the deal on prices, however, so lots of rigs are being laid down. We amateurs tend to think of "oil wells" and "gas wells," but we all need to learn more about GOR or gas-oil ratios. Image 4, of your series has been the cause of much exultation, see the NYT, but it's sobering as hell if you think about. Let's see, we added 1000 oil rigs, and perhaps 10,000 new oil wells in the space of 18 months of so, and production only rose 600,000 b/d. So we drove more wells in one year than the Saudis have done in their history, gaining 60 b/d per new well on average. Not much return for the effort. And you now need to offset depletion in the 10,000 new wells. It will be interesting to see how this looks once the Bakken plateaus. Will the Eagle Ford, Niobrara and others be able to boost the goose?